More than 11,000 teachers in Turkey have been suspended for alleged links to the outlawed Kurdistan Workers' Party (PKK), a week before children go back to school. Prime Minister Binali Yildirim had said he thought as many as 14,000 teachers were associated with terror activities. Turkey, alongside Western countries, regards the PKK as terrorists. Tens of thousands of school workers and private teachers were purged separately after a failed coup in July. Tens of thousands of people have died in a decades-long insurgency by the PKK, who want more self-rule for Kurdish people. Who did Turkey purge after the coup? Turkey's education ministry said 11,285 teachers had been suspended and were on paid leave pending an investigation. The state-run Anadolu news agency said they were suspected of activities "in support of the separatist terrorist organisation and its affiliates". It also said the number was meant to grow to 14,000 after an investigation carried out alongside local governors' offices. It is not clear what part of the country the suspended teachers are mainly from, but Turkey's Kurdish population is concentrated in the south-east, near the borders with Syria, Iraq and Iran. 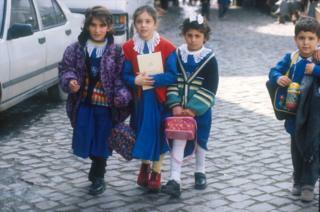 There are 850,000 teachers in Turkey, meaning the suspensions only affect less than 2% of teachers. However earlier this year, 15,200 education ministry officials lost their jobs and 21,000 private school teachers had their licences revoked, amid a crackdown on followers of cleric Fethullah Gulen, who Turkey's President Recep Tayyip Erdogan blamed for the failed 15 July coup. Turkey coup attempt: Who's the target of Erdogan's purge?